It is the oldest historical feature in Seychelles and our most popular landmark. TONY MATHIOT tells the story of the Victoria memorial Clock Tower. 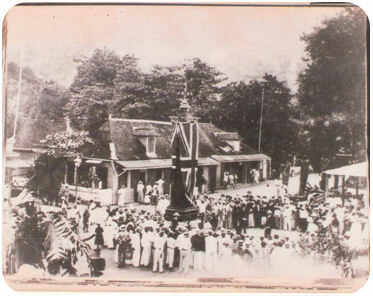 In the afternoon of Wednesday April 1st, 1903, a large crowd gathered in town to attend the inauguration of the Clock Tower by Ernest Beckham Sweet Escott (1857-1941), who was then the Administrator of Seychelles. The women were sprucely decked out in their full-skirted crinoline dresses and broad-brimmed white hats while the men cut an elegantly dapper figure in their long khaki trousers, white shirts and boaters. They had come from near and far for that patriotic occasion, travelling on foot, by boat and on horseback. Except for a few landowners, most of the men were plantation workers, blacksmiths and fishermen. And of course the women were, as in accordance with tradition of that epoch, managers of household affairs engaged in the daily task of domestic chores, housewives. Magnificently draped with the flags of the United Kingdom, the Clock Tower was unveiled and was solemnly declared a memorial to Queen Victoria Alexandrina who had recently passed away in January 1901 at the age of 82 years. The crowd listened in veneration to lengthy and magniloquent speeches extolling her Reign (1837-1901) and “the full measure of her devotion” as Empress of India (1876-1901). Needless to say, very few people present had ever seen the photograph of the pudgy and diminutive queen who had achieved the longest reign, 64 years, more than any other English Sovereign. At the risk of insulting their naïve ignorance, we can tentatively assume that no one had any idea of the imperial scope of the British Empire. They showed reverential admiration for the imposing black coloured structure with four clocks. There was no pageantry, no flourish of trumpets. Nevertheless, the ceremony was one of stateliness and dignified splendor. Everybody cheered. 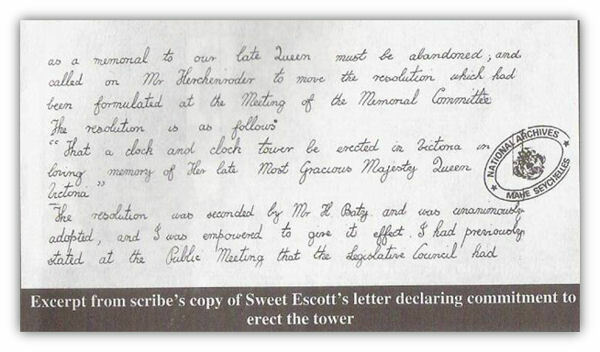 But Ernest Sweet Escott’s original idea for a memorial to Queen Victoria (1819-1901) was not the Clock Tower. Initially, he had a completely different venture in mind. The Calvinist – reared medical officer made no bones about his monarchistic tendencies. 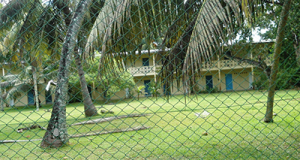 Soon after his arrival in Seychelles in 1900, he had made a proposal to the Secretary of State for the Colonies that a building which would serve as a community hall be erected to commemorate the reign of Queen Victoria. The Queen Victoria Memorial Committee, with Mr. Furcy Alfred Herchenroder (1865-1932), who was the judge at that time as its Chairman, was set up. On October 26, 1901, the Legislation Council voted for the sum of R10, 000.00 to be raised for the building. This was to be paid for partly by public subscription and partly by government. The mildewed Ledger of History informs us that at the turn of the 20th century there was widespread poverty in Seychelles, whose population was 19,772. The boom in vanilla production enhanced the well-being of only a few landowners while the majority of inhabitants led a hardscrabble life. Consequently, the response for donation was, to say the least, less than lackadaisical, which did not offend Mr. Sweet Escott. He was not unsympathetic to the plight of the poor. 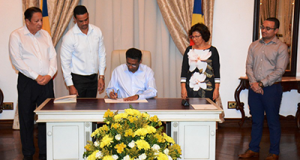 In fact, he was the distinguished example of the English colonialist who possessed an amiable personality that easily ingratiated him to the Seychellois people. In his habitual tweed suit and derby hat, he was a familiar figure with the inhabitants of Mahé, especially those in the South whom he visited very often during his Sunday perambulations. A road at Anse Royale honours his memory. The money collected fell drastically short of the required amount of SR 10,000.00. In all R3, 223.81 were collected. Without procrastination, Mr. Sweet Escott abandoned his plan for the building. In November 1990, he had written to the Crown Agents requesting for drawings and diagrams of various clocks and clock towers for his own “recreational interest”. After much scrutiny, he succumbed to the whimsical desire to have one similar to that which had been placed at the entrance of Victoria Station on Vauxhall Bridge Road in England put in place in Victoria. The one in England had been erected in 1892 to commemorate Queen Victoria’s diamond jubilee. So, as an alternative to erecting a building for which funds were grossly insufficient, on the June 31, 1902, the Queen Victoria memorial committee unanimously adopted the resolution “that a clock and clock tower be erected in Victoria in loving memory of her late most gracious Majesty Queen Victoria”. The Legislative Council gave approval for the available sum of SR6,447.62 to be used as funds for the memorial. On July 16, 1902 at the request of Ernest Sweet Escott, the Secretary of the Colonies authorized the Crown Agents in London to purchase the clock tower. The Clock Tower was made by a firm in Croydon, England, called Messrs. Gillet & Johnson, which had gained good reputation for specializing in making, on commission, that particular kind of clock tower in three different sizes. These were known as “Little Big Bens” in reference to the clock tower of the House of Parliament in London which was erected in 1859 (named after Sir Benjamin Hall 1802-1867). The Clock Tower made of cast iron came dismantled in nine cases by mail steamer. On February 11, 1903, seven cases arrived, the other two having been mistakenly carried to Mauritius! These arrived on March 11, 1903 and encountered further mishaps. While being transferred from steamer to lighter, one of the “movement weights” with a mass of 60 lbs was dropped overboard. A blacksmith by the name of Mr. William Vaudin (1866-1919) who was the Superintendent of Public Works made an ingenious replacement at the cost of SR15.81. The sum of SR1, 200.00 was spent on the foundation work, which took 17 days and was carried out by six workers, four Seychellois and two Indian workers. It is pertinent to note here that during the first decade of the 20th century dozens of immigrants workers from Madras, India were put to use in manual labour. The erection of the Clock Tower took nine days to complete. Winches and pulleys were used to lift up, assemble and connect the various parts. The last rivet of the Clock Tower was driven on March 27, 1903. A commemorative plate and wrought iron gate were made at the cost of £300.00 and oil lamps were fixed on the four sides. The Clock Tower was originally black which made it look more like a giant grandfather’s clock made of oak. In 1935, at the recommendation of the Governor, Gordon James Lethem (1886-1962), the Victoria City Council decided that it should be painted with a coating of aluminum silver to mark the silver jubilee of King V (1865-1936). In the 1960s, its four lamps were replaced with new ones which were attached to the structure itself. Over the years our beloved ‘Lorloz’ which stands 25 feet high, weighs 5 tons and has four dials which measures 2½ feet in diameter each has seen monumental changes take place in our capital. Rectangular wooden buildings with corrugated iron roofs and verandahs have been replaced by five storey edifices of concrete, glass and steel. Charming little houses with chimneys have yielded place to internet cafés, fashion boutiques, fast food restaurants and supermarkets. And the commotion of rickshaw pullers and draymen has been replaced by the noise and chaos of discordant traffic, the jarring sounds of screeching breaks and the nasty emission of gasoline smoke. 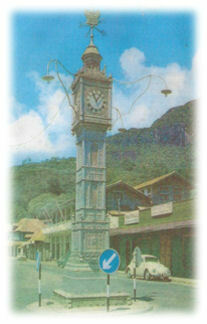 The Clock Tower was declared a National Monument in 1989. Did the clock ever chime? Well, no. Apparently, since the very first day the apparatus that should have struck the bell never worked and from then on nobody was concerned with the chiming of the clock or rather, the lack of it. Although now it does chime – the sound of its bell was first heard in Victoria on September 17th, 1999, after the Clock Tower had undergone a major renovation including the replacement of its spring-driven mechanism by an electronic one, which interestingly enough was obtained from the still existing makers of the Clock Tower, Messrs Gillet & Johnstone. Mr. Eddie Belle, Chairman of the National Monuments Board, visited the firm in the U.K to select the appropriate one. Mr. Brian Mazzorchi constructed the metal container at the base of the Clock Tower in which the electronic devices are enclosed. This consists of a dynamotor and a digital clock which coordinates the function of the four clocks, and adjusts the hands of the clock whenever there is an electrical cut. Sheer ingenuity! A major breakdown happened in March 1994 when the balance weight weighing around 75 kg suddenly dropped, breaking the linkage system that controlled the entire clockwork mechanism. Mr. John Gouffe, a mechanic of Majoie, well known for his proficiency in dealing with technical defects of that sort, repaired it promptly and before much time could elapse the clocks were back in perfect working order. But not for long. Sometime in April 1996, the time on the clock facing west was set back by five minutes after pigeons had perched on its minute hand! In the 1960s, a well known mechanic named Gilbert Palmyre (1912-1992) was assigned the noble responsibility of maintaining the Clock Tower. He had the daily task of winding up the Clock Tower mechanism and ensuring that the time on the four clocks corresponds to Greenwich Mean Time. 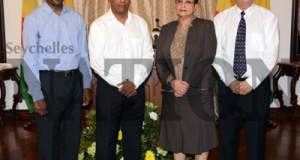 Mr. Palmyre is also credited for setting up the first garage and first car hire business in Seychelles. For over fifteen years, he was known as the “care taker” of the Clock Tower. He died in 1992 aged 80 years. In 1978, Mr. William Lespoir, a young mechanic barely out of his teens, was given the custody of the Clock Tower and has been its best friend ever since. The story of the Clock Tower has not remained unflavoured with local mythology. A tale that was popular in the 1920s tells that when workers were digging the ground to build the foundation for the Clock Tower, they had unearthed the skeletal remains of a young nun who perished in the great landslide (‘lavalas’) that had happened on the night of October 12, 1862. In dire consequence of that, the “ghost” of the young nun had been disturbed. From then on, every year on October 12 at midnight the clock chimed and inhabitants of Victoria claimed to have seen the figure of a nun hurrying through the town’s streets. And always, on the following morning, broken rosary beads were found scattered near the Clock Tower. These were picked up and kept or worn as amulets! At the turn of the century the Clock Tower was more than just a sublime structure with Corinthian motifs and Victorian heraldry. People used the clock to know the time of the day. Those were the days when Rolex, Omega, Cartier and Seiko Quartz wristwatches were virtually unheard of in Seychelles, though a few people who had travelled abroad were in proud possession of a Breguet Pocket Watch. Throughout all those decades, when we looked up at the clock to know the time, we were oblivious of the moving organs at work inside the Clock Tower: those tiny cylindrical bars and circular discs. The meshing of gear wheels and the reciprocal motion produced by curved wheels mounted on rotating shafts. The spirals and concentric rings. Cogwheels engaging racks, all working in mechanical harmony to create the subtle regularity of precision in order to provide the steady and uninterrupted rhythm of the pendulum. Infinitesimal movements that we were never aware of when we gazed up at the dials to know the time. Since that April afternoon in 1903, Victoria may have changed beyond recognition but Lorloz still stands in radiant conspicuity at the crossroad where Independence Avenue, State House Avenue, Albert Street and Francis Rachel Street inevitably meet.